Preheat oven to 400 degrees Fahrenheit or whatever the puff pastry package says. Thinly slice apples and put in bowl with lemon juice. Add melted butter to sugars, and mix in spices. Pour into bowl with apples and coat well. Roll out puff pastry into tart pan. Press into pan and use a fork to add holes to the dough. Add apples—you can make design for a pretty tart or just throw them in. Top with remaining juice from apples. Bake tart in oven 30 to 45 minutes or until golden brown. 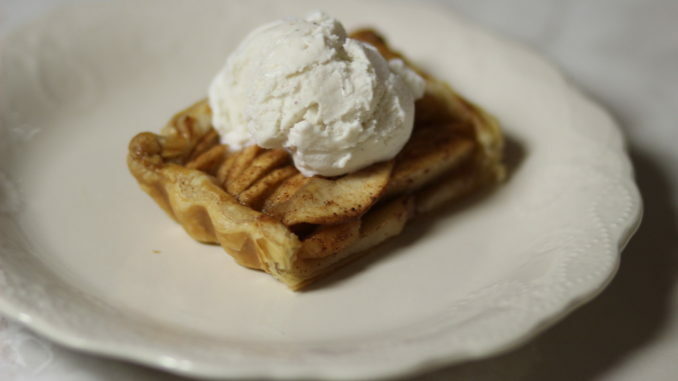 Once cooled, remove from tart pan and serve warm or cold with ice cream or whipped cream. This dessert is great year-round. It’s the perfect patriot sweet treat for the Fourth of July or something to warm the belly during the holidays!